Virginia Davis works with ikat weaving and other resist techniques, both as an internationally exhibited studio artist and from technical, historical, and ethnographic perspectives. Her awards include a Fulbright to India and several individual Visual Artist grants from NEA and the New York State Council for the Arts. In 1995, in Mexico, via a joint NEA and Fondo Nacional para la Cultura y las Artes Award, she taught and researched Mexican resist techniques. She lectures and gives workshops, and she is widely published. 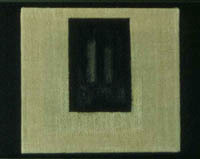 I literally weave painter's linen canvas similar to the sort that can be purchased from artists' materials suppliers. Ikat technique, dyeing and painting the yarn before weaving, enables color and image to be embedded in the woven structure and locked inside the canvas. From a 1990's perspective, my work examines and reinterprets minimalism in the context of the symbolic significance of textile imagery. I comment on the materials of art, referencing the 16th century transition from images realized in fresco or on wood to painting on fabric (oil on linen). The image is caught inside the canvas in my deconstructed paintings. Formally, the work explores optical aspects of vision and nuances of value contrast. Color reflects light differently depending on whether it is placed in the warp or weft. The representation of space occurs through color overlay. There is a play of edge, hard and feathered. Theme and variation interact and cumulate, stimulating a meditative feeling. The work raises questions, pushes at boundaries and challenges old definitions.